As part of the Community Foundation of Western Nevada’s innovative solutions for housing in the Reno area, The Village on Sage Street project began in Spring 2018 to provide stability through housing to low-income individuals. This unique coed “dorm-style” facility is comprised of eight modular buildings with 200 small single occupancy units for individuals that are at least 18 years of age. The Village is primarily designed to serve working people earning minimum wage, or those with other income sources such as social security or disability, as a low-income housing option. The Village will provide a foundation and stability for its residents and contribute to the overall well being of the entire community. 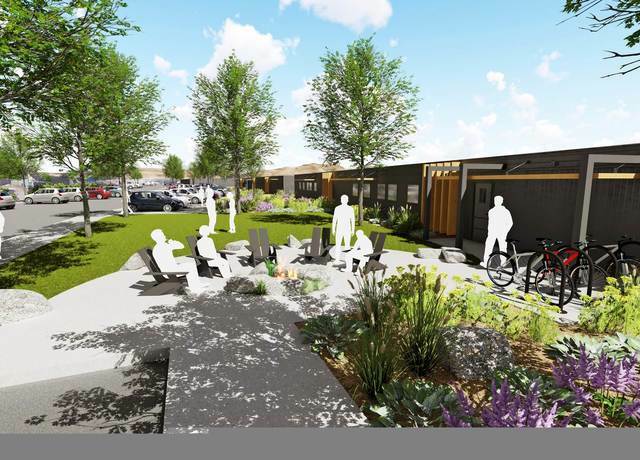 The community is comprised of several pre-fabricated modular buildings with adjacent onsite parking. The 200 individual private single occupancy units which include a built-in bed, closet, desk, and flat screen television. The Village also has onsite laundry, meeting and recreation spaces, is WI-fi compatible, and provides an outdoor gathering area. INTERESTED IN APPLYING TO LIVE AT SAGE STREET VILLAGE? The rental unit rate is $400 per month. A $400 security deposit will be required. The online form is only for the initial intake and will be used as a pre-application to be placed on the waiting list. Applicants will be contacted within 30 days. The full application process will include additional information such as verification of income and a background check. Volunteers of America (VOA) has understood the power of housing as a foundation for life since its beginnings in 1896. And since those early days, Volunteers of America has grown into one of the largest and most effective nonprofit housing organizations in the nation. VOA is strengthening communities everyday by providing the blueprint and tools for individuals to rebuild their lives and reach their full potential through housing and employment.